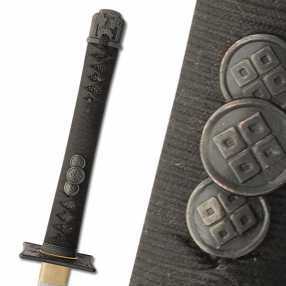 Counterpart to the Iga Ninja-To, the Kouga Ninja-To features a dismountable double-pegged Tsuka with a battle wrap over black rayskin and Kouga Mon Menuki. 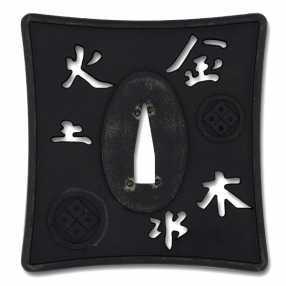 The blackened iron Tsuba features the Kouga Mon and pierced Kanji, a theme repeated on the Fuchi/Kashira. The Kanji and Mon are also employed on the blackened fittings of the spiked Saya. The Kouga features a forged high carbon blade, differentially quenched to an edge hardness of 60HRc. 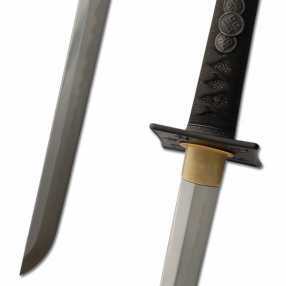 Differentially Hardened Sharpened 1566 High Carbon Steel blade with enhanced hamon. Cotton ito battlewrap over REAL blackened rayskin. Iron fittings. 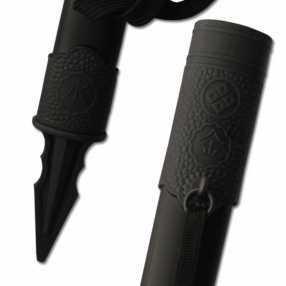 Flat black saya with spike. This is a very nice chokuto. The saya is handsome and well made. The tsuka Ito is very tight. The tsuka is comfortable to hold. 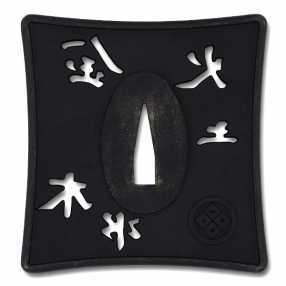 The tsuba looks good. The blade with a real but enhanced hamon is beautiful. In a perfect world it would be nicer if the whole blade had been polished to bring out the hamon. But it's good. I found a thirteenth century scroll celebrating a Japanese victory during the Mongol invasion of Japan in 1274 which clearly shows one samurai carrying a chokuto (straight sword). So these swords were around in the early medieval period. How many "ninja" carried straight swords at this time is anybody's guess. 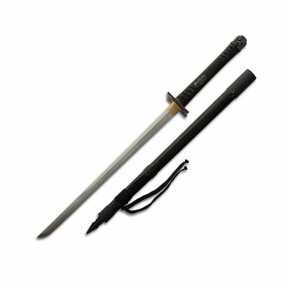 But this sword is within the realm of historic accuracy for the very early medieval era of Japan. Interestingly there was another sword on the same scroll which while curved definitely had a square tsuba. More importantly the Hanwei Kouga Ninja-To is a beautiful, well balanced and tight sword.